Sometimes the weather is clear enough, but just hazy enough, to reveal the details of the landscape for quite some distance. 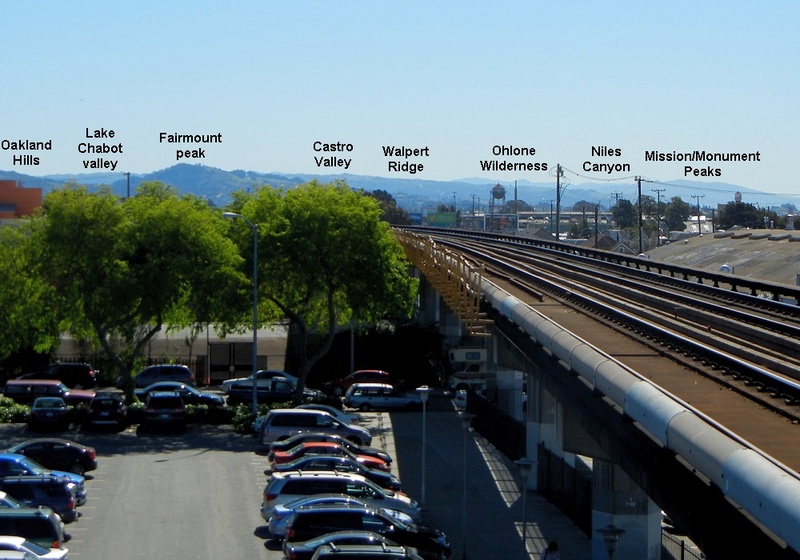 A week ago the view down the line from the Fruitvale BART station looked like this. I know it’s a small image, so click on it for an annotated 1000-pixel version. Most of the view extends beyond Oakland city limits. The farthest peaks are in the Ohlone Wilderness east of San Jose, some 30 miles away. Once you become familiar with our skyline, it’s never boring. This entry was posted on 24 March 2014 at 7:44 pm and is filed under Oakland geology views. You can follow any responses to this entry through the RSS 2.0 feed. You can skip to the end and leave a response. Pinging is currently not allowed. I held a similar view when biking down International Blvd on Bike to Work Day. I looked at that hill in the distance and asked, “is that hill in Oakland?” At the BART station in Hayward, I figured out it was miles more.